I started things out pretty easy on days one and two of this series but today, we're going to take things up a notch. 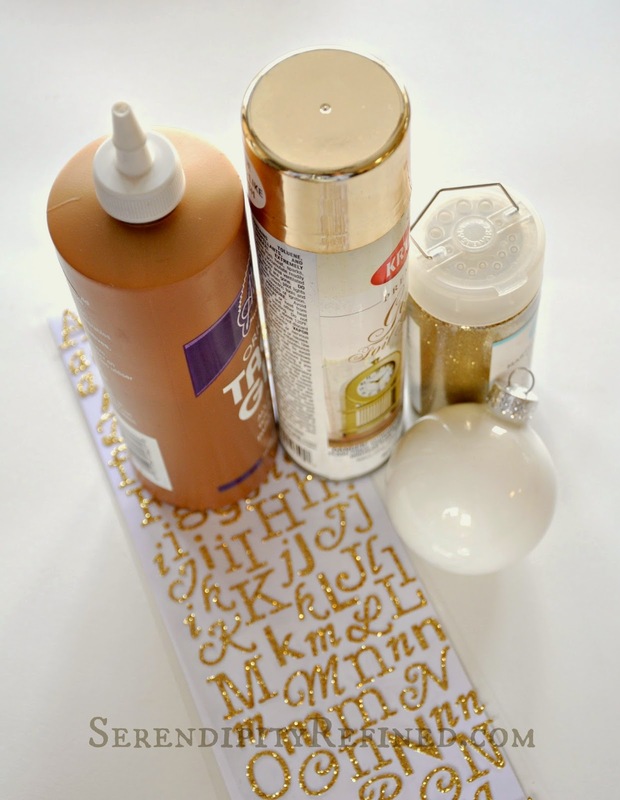 Today, we're creating a gold and white monogrammed glass ball ornament using spray paint and yes, more glitter! Remove the top from the ornament. Using masking tape, mask off the middle part of the ornament in a strip that's about the width of two rows of making tape. Of course, it will take about eight actual pieces of masking tape because the ball is round and it needs to overlap slightly so that the paint doesn't get in. I used an Exacto knife to make the circles round after I taped. Press just firmly enough to cut the tape. Exacto knives can scratch the glass. Take your can of gold spray paint outside, preferrably before dawn so that the neighbors don't see you and wonder why you are outside with spray paint in your night gown. Spread newspaper on the driveway. Spray paint only the ball. DO NOT spray the top of the ornament as I have done in the photo above. It doesn't look nice on the finished ball. Trust me...go with the contrast. It's better and easier than painting that little metal thing. Note: It helps the ball to stand upright (so that you don't have to chase it all around the driveway while painting) if you set it on the lid from the spray paint or the lid from a water bottle. Again, just trying to keep you from looking as silly as I did at 6:30 in the morning when I was doing this. After the paint is dry, remove the tape. Clean up any over spray that's on the ornament (also your hands and maybe just the front toe of your left sneaker) using Carb + Choke cleaner and a qtip. I'm not kidding .....the stuff's like magic! Wash your hands with soap after using it on your skin. Using a fine paint brush, draw a line of glue where the spray paint meets the ball. 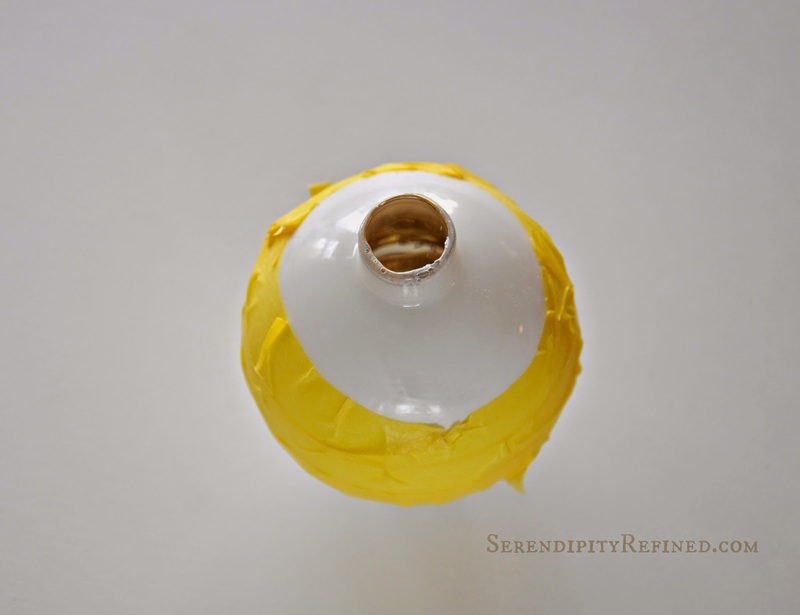 Sprinkle the glue line with fine gold glitter and allow to dry (resting on a water bottle cap). 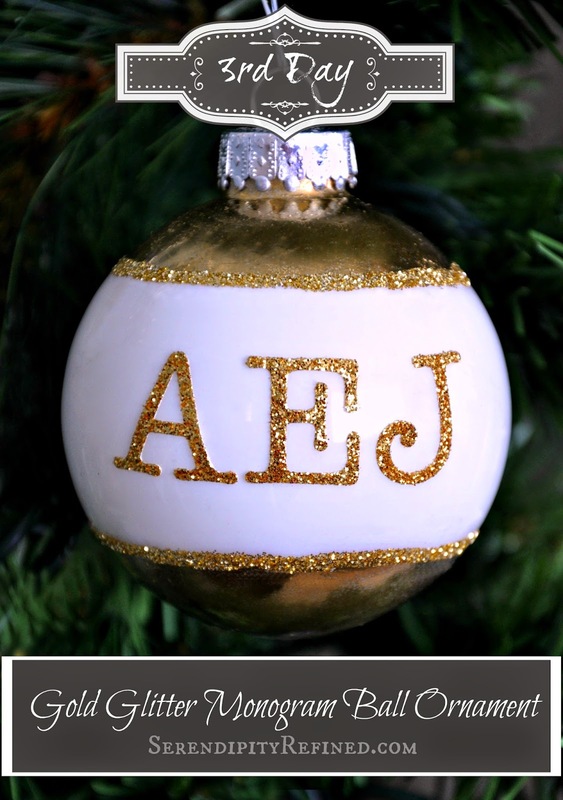 Finally, apply the monogram using stick on glitter letters (or gold Sharpie marker or, if you have steady hands, a line of glue and more glitter). 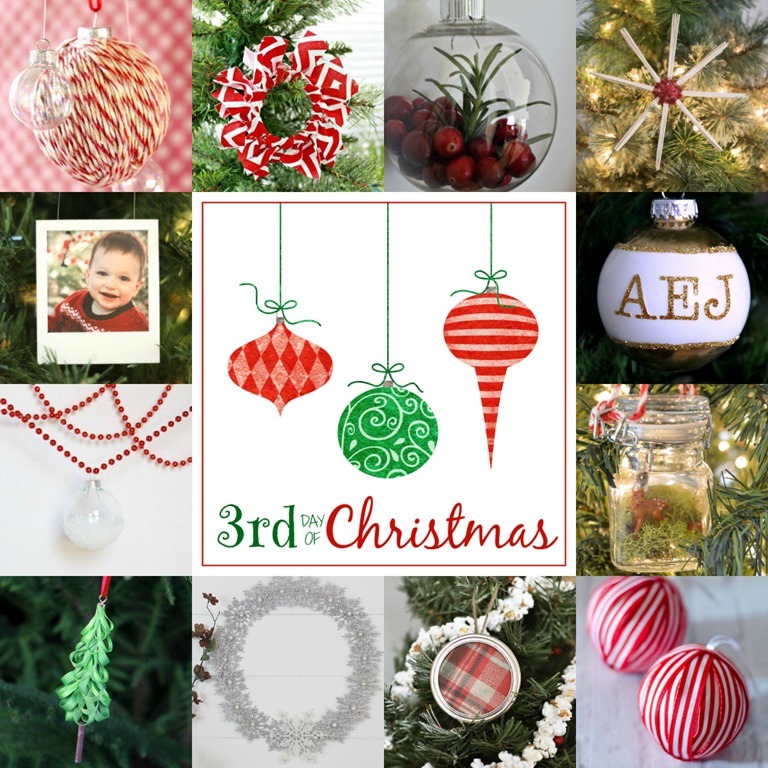 Make sure to visit the other bloggers and see what they're making today. 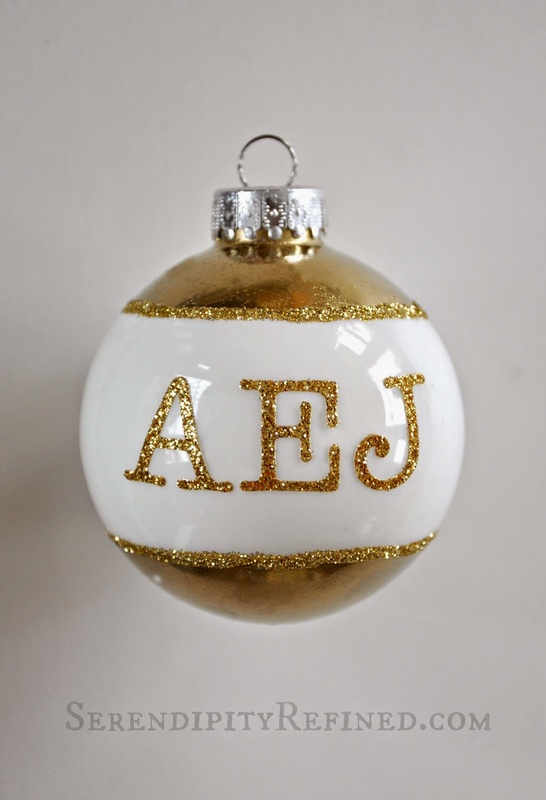 Now you have a lovely monogrammed gold and white glass ball ornament to add to your growing collection and you can make some for your friends too. After all, they do come in a package of eight! 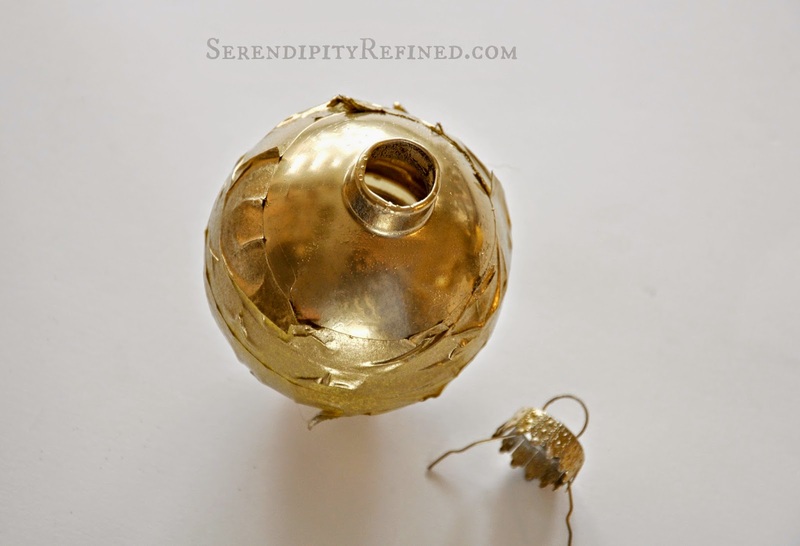 Don't forget to stop by tomorrow to learn how to make an ornament using a wood thread spool!